Are you looking to Recover Mail data from Outlook Mac 2011, Has your Outlook Mac 2011 crashed and you have lost all your Mails? 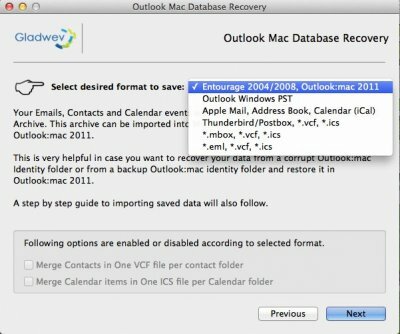 You can use Outlook Mac Database Recovery App to Quickly recover all your Outlook Mac Mails, Contacts and calender events in a format compatible with Outlook Mac 2011 for a reimport and usability. Step 2 : After the download is complete, click on the downloaded “Outlook Mac Database Recovery 1.0.101.dmg” to begin installation. Click Continue to proceed. Step 3 : Outlook Mac Database Recovery App setup wizard will open. Click on “Install”. You will be prompted for your Administrative system User name and Password. Please enter and click Install Software. Installation is finished, please click close. 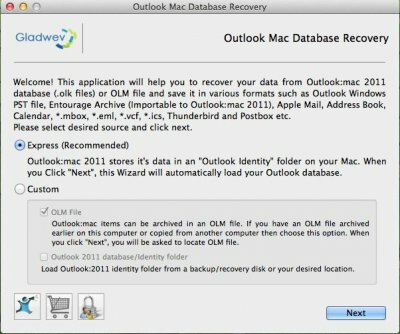 Step 4 : Please Launch Outlook Mac Database Recovery App by clicking Go under File Menu >> Applications >> Outlook Mac Database Recovery. You are Presented with Options to proceed with conversion. Express mode is recommended as it Auto detects your Mails data in Outlook Mac Database folder from default profie location of Outlook Mac 2011. If the Mail data is located in any folder other then the default location, please choose the Custom option and select choice Outlook Mac 2011 database/ Identity folder and point to the Folder containing your Outlook Mac Database. 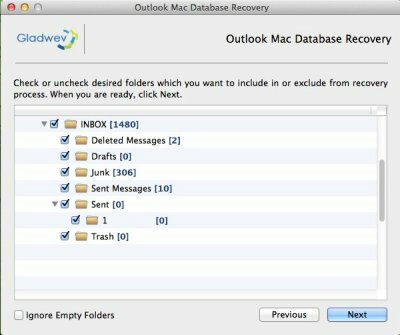 Step 5 : Outlook Mac Database Recovery App reads your Outlook Mac Database folder and displays the folder structure. Please choose the folders you would like to be recovered. Step 6 : You have a choice to save the recovered data for import into Entourage, Outlook Mac , Outlook windows, Apple Mail, Thunderbird, Postbox, mbox, eml file format. After Choosing the desired output format click "Next" to start. You may choose to Merge the Contacts and calender events into one. You will be prompted to choose a folder to save the recovered output file. 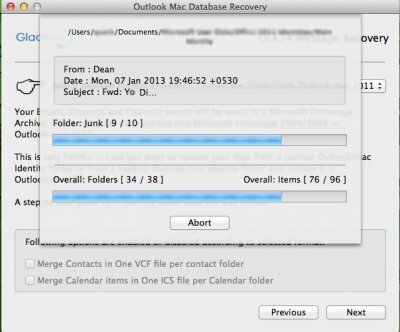 It is recommended to Create a New Folder by the Name of "Recovered Outlook Mac Data" on Desktop for easy findability. 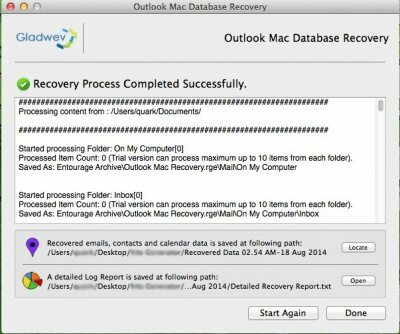 Step 7 : Outlook Mac Database Recovery App will start the recovery process. You may go grab a coffee for a while. By the time you are back the receovery should be completed. Step 8 : Once the Recovery is completed . A report on recovered data status is displayed and desired Output file has been created. Click on Locate button to have a look at the Output file or you may directly navigate to Desktop >> "Receovered Outlook Mac Data" folder you created on your own to find the recovered data.